The latest explosions in the Moscow metro were most likely prepared in the Caucasus, specialists of Russian law-enforcement agencies believe. Terrorists may have organized the attacks in response to recent successful operations of the Russian federal troops in the Northern Caucasus. Russian troops have recently destroyed such terrorist leaders as Said Buryatsky, Anzor astemirov, Salambek Akhmadov and Abu Khaled. A whole terrorist group has been destroyed in the republic of Ingushetia. 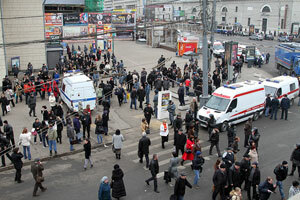 Analysts say that the two explosions occurred at the oldest line of the Moscow metro, known as the Red Line. “The choice of the place where they blew up their bombs is not incidental. The first explosion took place at the Lubyanka station – near the location of Russia’s No.1 security agency,” an analyst told Interfax. Russian military officials said last week that there were up to 500 terrorist groups operating in the Northern Caucasus. Gen. Nikolay Rogozhkin said that it was impossible to determine the exact number of the terrorists. 23,000 servicemen of Russia’s Internal Troops, including over 1,000 Chechen military men oppose terrorists in the Caucasus. The troops destroyed about 200 terrorists in the Northern Caucasus in 2009.